Probiotics are friendly bacteria that support digestion and other processes in the body. There are over 400 types of bacteria found in the digestive tract. The most common are Lactobacillus and Bifido. These “good guy” bacteria help break down food and even help fight off harmful invaders, too. Let’s take a closer look at how they benefit women. Women are more likely to suffer from gastrointestinal disorders than men. Research shows women who take probiotics regularly experience relief and have less difficulty with bowel movements. Not only do probiotics help digestion, some evidence suggests they also reduce the risk of issues like UTIs and bacterial vaginosis. Women with low levels of gut bacteria, like the Lactobacillus and Bifido strains, suffer from these conditions more often than those with normal levels. These friendly bacteria promote an acidic environment in both the urinary tract and vaginal area, which helps keep unwanted bacteria in check. In many cases, however, pregnant women suffer the opposite effect – temporary diarrhea. Probiotics can help with this as well, as they help to slow the passage of food through the digestive tract. This helps to regulate digestion; the slower movement of food also means a better chance for nutrient absorption, which is incredibly important during pregnancy. Probiotics are available in several forms and different individuals may respond differently. For pregnant women, yogurt and kefir may not be ideal. This is particularly true when morning sickness is present. And, not all yogurt contains probiotics. Look for the phrase ‘contains live cultures’ and review which cultures are included. It's always best to double-check the label to make sure you know what you're getting. 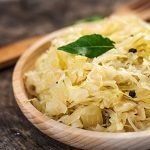 Pickled or fermented foods like sauerkraut, kimchi, miso soup, and pickles are great sources of natural probiotic bacteria. 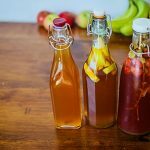 The fermented tea, kombucha, is also a tremendous source of probiotics. Of course, if your pregnancy is hampering your ability to eat food and keep it down, probiotic supplements are also available. Just be sure to check with your doctor first. 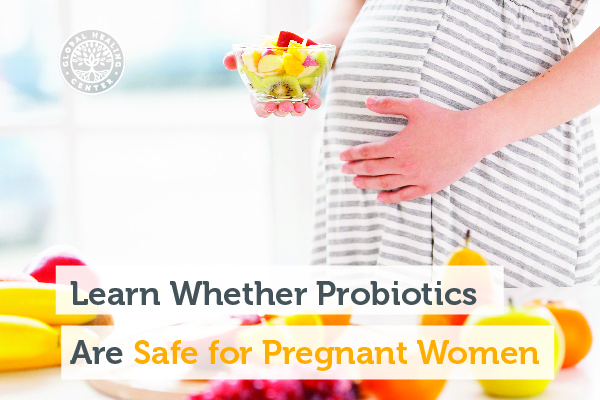 Taking probiotics while pregnant or breastfeeding is generally considered safe, as probiotics stay in the digestive tract and do not enter the blood. That means that they will in no way reach a developing fetus or a breastfeeding baby. They do, however, improve digestion and availability of nutrients that are important to both mother and child. Should Newborns Be Given Probiotics? Recent research shows newborns who take some form of probiotic shortly after birth do enjoy better health and have stronger immune systems. The study showed that of 925 infants, those given probiotics needed fewer antibiotics than the group who received the placebo. 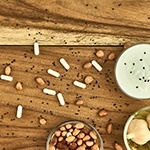 Researchers noted, “Feeding synbiotics to newborn infants was safe and seemed to increase resistance to respiratory infections during the first 2 years of life.” Another study reported infants of mothers with allergies who took probiotics had a lower risk of developing allergies by 12 months than those who did not. Although that's interesting news, whether or not a new mother gives her child probiotics is a decision she needs to make with her child’s pediatrician. Have you taken probiotics? We’d love to hear about it, especially if you did so as a pregnant or nursing mother. Please tell us about your experience in the comments below! National Center for Integrative and Complementary Health. Probiotics , last updated July 2015. Sun-Young Lee, Jeong Hwan Kim, In-Kyung Sung, Hyung-Seok Park, Choon-Jo Jin, Won Hyeok Choe, So Young Kwon, Chang Hong Lee, Kyoo Wan Choi. Irritable Bowel Syndrome Is More Common in Women Regardless of the Menstrual Phase: A Rome II-based Survey . J Korean Med Sci. 2007 Oct; 22(5): 851–854. Published online 2007 Oct 31. doi: 10.3346/jkms.2007.22.5.851. Niedzielin K1, Kordecki H, Birkenfeld B. A controlled, double-blind, randomized study on the efficacy of Lactobacillus plantarum 299V in patients with irritable bowel syndrome . Eur J Gastroenterol Hepatol. 2001 Oct;13(10):1143-7. Dimidi E, Christodoulides S, Fragkos K, Scott SM, Whelan K. The Effect of Probiotics on Functional Constipation in Adults: A Systematic Review and Meta-Analysis of Randomized Controlled Trials . The American Journal of Clinical Nutrition, July 3, 2014. Balzaretti S, Taverniti V, Rondini G, Marcolegio G, Minuzzo M, Remagni MC, Fiore W, Arioli S, Guglielmetti S. The Vaginal Isolate Lactobacillus Paracasei LPC-SO1 (DSM 26760) Is Suitable for Oral Administration . Front Microbiol. 2015 Sep 15;6:952. doi: 10.3389/fmicb.2015.00952. eCollection 2015. Hoppe M, Onning G, Berggren A, Hulthen L. Probiotic Strain Lactobacillus Plantarum 299v Increases Iron Absorption from an Iron-Supplemented Fruit Drink: A Double-Isotope Cross-Over Single-Blind Study in Women of Reproductive Age . Br J Nutr. 2015 Oct;114(8):1195-202. doi: 10.1017/S000711451500241X. Plaza-Diaz J, Gomez-Llorente C, Fontana L, Gil A. Modulation of immunity and inflammatory gene expression in the gut, in inflammatory diseases of the gut and in the liver by probiotics . World J Gastroenterol. 2014 Nov 14; 20(42): 15632–15649. Published online 2014 Nov 14. doi: 10.3748/wjg.v20.i42.15632. Slyepchenko A, Carvalho AF, Cha DS, Kasper S, McIntyre RS. Gut emotions - mechanisms of action of probiotics as novel therapeutic targets for depression and anxiety disorders . CNS Neurol Disord Drug Targets. 2014;13(10):1770-86. Misra S, Medhi B. Role of probiotics as memory enhancer . Indian J Pharmacol. 2013 May-Jun; 45(3): 311–312. doi: 10.4103/0253-7613.111917. Corliss, J. “Probiotics May Ease Constipation” . Harvard Heart Letter, August 21, 2014. Elias J, Bozzo P, Einarson A. 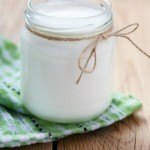 Are probiotics safe for use during pregnancy and lactation? Canadian Family Physician. 2011;57(3):299-301. Kukkonen K1, Savilahti E, Haahtela T, Juntunen-Backman K, Korpela R, Poussa T, Tuure T, Kuitunen M. Long-term safety and impact on infection rates of postnatal probiotic and prebiotic (synbiotic) treatment: randomized, double-blind, placebo-controlled trial . Pediatrics. 2008 Jul;122(1):8-12. doi: 10.1542/peds.2007-1192. Huurre A1, Laitinen K, Rautava S, Korkeamäki M, Isolauri E. Impact of maternal atopy and probiotic supplementation during pregnancy on infant sensitization: a double-blind placebo-controlled study .Clin Exp Allergy. 2008 Aug;38(8):1342-8. doi: 10.1111/j.1365-2222.2008.03008.x. Epub 2008 May 8.